If someone would have read this title to me 20 years ago I'd have thought that they were nuts. "How to choose a light bulb" - Really? Shopping for light bulbs used to be easy: A quick grab for the usual replacement 60-Watt bulb while walking down the grocery store isle. Now with hundreds of choices it requires a trip to a more specialized store and choosing a light bulb has turned into quite a frustrating ordeal. The terminology is confusing and the choices intimidating. 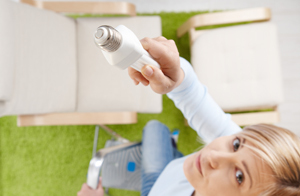 LED, CFL, Halogen… What is best for my space? What do the new terms on the labels mean? Why did “they” ban our regular light bulbs? Well, nobody actually banned the incandescent lamps, but it sure feels that way. 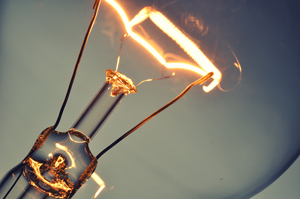 The so-called light bulb ban is the result of new energy efficiency standards. The Energy Independence and Security Act was signed in 2007. This energy policy was aimed at making this country more energy independent while making better use of our resources. The law doesn’t force manufacturers to discontinue producing the good old Edison bulbs outright, but just mandates that they improve them so they provide more lumens per watt (get a better gas mileage.) But of course, since that’s not yet possible – it’s kind of like a ban. The filament of an incandescent bulb can only be heated to a certain degree and still have a decent lifespan. The light emitted from the bulb is therefore in the warm yellow- orange-red spectrum. There are an estimated 4 billion lamp sockets in the US that take incandescent screw-in type bulbs with 3 billion still in use with this 130 year old technology. What about halogen bulbs? Halogens are technically incandescent bulbs. Both have a tungsten filament, which is heated to produce light inside a glass envelope filled with inert gases, in this case halogen. But one significant difference makes halogen bulbs consume less energy while producing a crisper, white light: the halogen cycle. Halogen in the fill gas prevents tungsten from being deposited on the glass of the bulb. Instead it is redeposited onto the filament, a process called the halogen cycle, which keeps the envelope clear throughout is life span. In addition, high pressure inside the envelope slows down the deterioration of the filament and increases the life of the lamp. Of course, the high pressure calls for better quality glass and halogen lamps actually use quarz, not glass. All these factors make it possible to operate the lamp at higher temperatures, which in turn gives us more lumens per watt and produces light of a crisper, whiter quality. Halogen lamps come in many shapes and sizes. The larger, screw-in type lamps are 120V just like their Edison lamp brothers. They are sturdier, heavier and actually have a small quarz bulb inside an outer envelope. The reflector type halogen lamp offers beam spreads from very narrow spots to wide floods and they are therefore suitable for a variety of jobs from outdoor flood lighting to illuminating retail stores, coffee shops and artwork. Since we are only covering alternatives for our screw-in type bulbs here I won’t get into the tiny, hot halogen bulbs with amazing color quality at this point. They are a chapter for themselves. 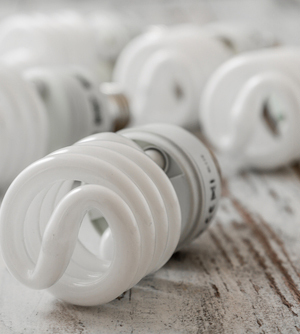 Over the last 30+ years we have all gotten used to the curlicue CFLs (compact fluorescent Lamps) and know all about their energy saving virtues. In a CFL, the current goes through a long, thin, twisted tube that contains argon and a small amount of mercury vapor. This generates ultraviolet light that excites the fluorescent phosphor coating on the inside of the tube. (Yes, “excites”. This is a technical term and probably the only time I’d use that word in the same sentence as “CFL”.) This process then causes the CFL to emit visible light. If you want to replace a bulb in a floor or table lamp where the shade rests on a harp you need to check out if the ballast (the bulky part between the socket and the glass) will fit. Take the harp with you to the hardware store if it is easy to remove. You might have to get a new harp as well. If your shade rests on the bulb with a bulb clip it might become tricky and you might have to add a harp base to your lamp so you can use a harp instead. (Unfortunately this requires removing the socket, but it’s not that complicated.) Many CFLs are shaped differently from “regular bulbs” and the shade clip won’t stay put. It is so amazing and exciting to see, how LEDs have almost taken over the lighting sector in just a few years. Right now LEDs are generating all the buzz in the lighting news, and rightfully so. It is said that the advent of the LED is going to revolutionize the lighting industry at least on the same scale as the invention of the light bulb. We have apparently just scratched the surface! In a nutshell: LED stands for Light Emitting Diode. It is Solid State Technology, so there are no filaments or tubes, mercury or glass envelopes, but a semiconductor chip that glows when a current runs through it. We have known LEDs for years in traffic lights and on control panels everywhere from our cars to our ovens. But they were all pretty dim and not a usable color for reading or other tasks. When an LED diode that could produce bright blue light was finally developed in the late 90’s it was considered such a significant innovation that the three inventors were awarded the Nobel Price in October 2014. This was the last step needed to complete the color spectrum, since white light can be made from combining red, green and blue wavelengths. Finally it became possible to make white LED light that was bright enough to illuminate a room. It is amazing, how fast it went from there. Now, 20 years later LED “bulbs” are everywhere on the shelves and at prices that are starting to be acceptable, especially when you take the advantages like energy savings and lifespan into account. And it will go even faster from here! LEDs are generally not omnidirectional (emitting light in all directions), but are by design better suited for directional lighting. This said, there are a lot of LED “bulbs” on the market that are designed to replace the incandescent household bulb. If you look closely, you’ll see a number of individual diodes distributed in a pattern inside each light bulb shaped form. Together they create an omnidirectional light. Not all manufacturers do this equally well. In some cheaper LED bulbs the light primarily comes out the top or they have very visible “hot spots”. Why can’t we just stay with watts, why do “they” have to come up with Lumens? Well, we are talking about two different things, like with a car, talking about miles and gallons. But once the curlicue compact fluorescent lamp hit the market just talking about watt didn’t work so well, since a CFL only uses 23 to 30 Watt to produce the same amount of light as a 100W incandescent bulb. And now with LEDs it just doesn’t make sense anymore to only talk about how much energy is spent instead of just comparing how much light we get when we buy a lamp. The socket in my table lamp is rated for 60W. I want to switch to an energy saving bulb. Can I use an LED or a CFL that produces more light if I make sure it doesn’t exceed the wattage recommended for the fixture. The short answer is yes Lamps and fixtures have a maximum wattage rating to prevent the wiring and the socket from overheating which could cause a fire. Since LEDs and CFLs use a fraction of energy (watts) while producing the same amount of light (lumens), they produce far less heat. So you can use a CFL or an LED that provides more light than an incandescent as long as it doesn’t use more electricity (watts) than the fixture recommends. You still need to look if the replacement bulb is a good fit for your lamp and if you are dealing with dimming or completely enclosed fixtures you might run into problems. Check the packaging to see if the new bulb is dimmable and especially for LEDs look if the box specifically says that the LED is ok for enclosed fixtures. 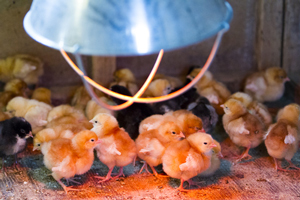 LEDs don’t generate much heat, but on the other side they don’t like heat build-up.